Hewlett Packard - 147094-001 HP/COMPAQ - 1X8 -PORT 1U KVM SERVER CONSOLE SWITCH (100-230 VAC) WITH RAILS FOR PROLIANT SERVERS (147094-001). REFURBISHED. IN STOCK. SHIP SAME DAY. Hewlett Packard - 396635-001 396635-001 HP 8 Port KVM IP Console Switch Expansion Module. New Bulk Pack. Hewlett Packard - 147091-001 HP/COMPAQ - 2 X 8 PORT RACKMOUNT 1U KVM HI RESOLUTION MONITOR SERVER CONSOLE SWITCH (147091-001). REFURBISHED.IN STOCK. SHIP SAME DAY. Dell - 3R875 3R875 Dell 8 Port KVM Console Switch Expansion Module. New Bulk Pack. Dell - HR2DD HR2DD Dell-8 Port EXP KVM Module KVP IP. New Bulk Pack. Hewlett Packard - 262589-B21 262589-B21 HP 8-Ports KVM Console Switch Expansion Module. New Bulk Pack. TRENDnet - TK-803R TK-803R Trendnet 8-Port USB Ps 2 Rack Mount Kvm Switch - 8 X 1 - 8 X Hd-15 Keyboard Mouse Video - 1u - Rack-Mountable. New Retail Factory Sealed With Full Manufacturer Warranty. Hewlett Packard - 262589-B21 HP/COMPAQ - 8 PORT IP/KVM CONSOLE SWITCH EXPANSION MODULE (262589-B21). IN STOCK. SHIP SAME DAY. Dell - 71PXP 71PXP Dell 8 Port Rackmount KVM PS 2 VGA Switch. New Bulk Pack. 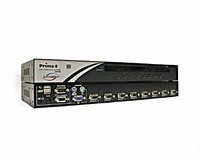 Belkin - F1DA108Z F1DA108Z Belkin Omniview Pro3 Usb & Ps 2 8-Port Kvm Switch Kvm Switch 8 Ports Stackable. New Retail Factory Sealed With Full Manufacturer Warranty. 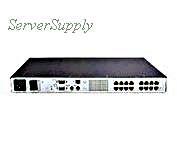 Hewlett Packard - 340386-001 HP/COMPAQ - RACKMOUNT SERVER CONSOLE CAT5 1X 8port 1U RAIL KVM SWITCH (340386-001). REFURBISHED. IN STOCK. SHIP SAME DAY. 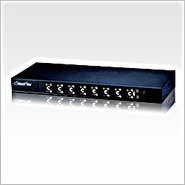 Tripp Lite - B072-008-1 B072-008-1 Tripp Lite Netcommander KVM Switch 8 Ports Desktop. New Retail Factory Sealed With Full Manufacturer Warranty. 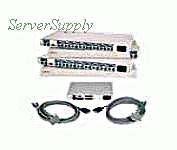 Hewlett Packard - 336044-B21 HP/COMPAQ - COMPAQ KVM SERVER CONSOLE SWITCH CAT-5 0 X 1 X 8-PORT (336044-B21). REFURBISHED. IN STOCK. SHIP SAME DAY. ASOUND - CAB831HD CAB831HD Startech 8 Port USB Ps 2 KVM Switch Modules. New Retail Factory Sealed With Full Manufacturer Warranty.